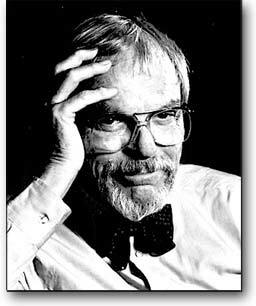 A friend of mine, Jay Sabicer, once mentioned to me that he interviewed Chuck Jones as part of his thesis project on artists when he was a student at California State University, Fullerton. So I thought it would be fun to feature his interview in association with the Eric Goldberg piece. His interview was conducted in March 1987, and the film most identified with launching the resurgence in animation, Who Framed Roger Rabbit?, was still in the middle of production. Jones was a consultant on that film and was about to head over to England and visit the Director of Animation for that film, Richard Williams, when Jay visited him. 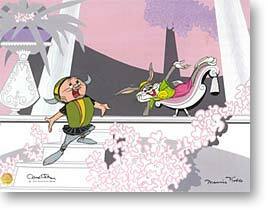 At the time of this interview, Chuck Jones enjoyed semi-retirement at or near his home in Southern Orange County, every once-in-awhile dipping back into the art he cares for so much. My conversation with him dealt with the industry in general, where it's headed and how it evolved. I also posed questions on how he began, first an animator and then later as a director. I wanted to get a glimpse of how this man's mind worked and what was in store, as far as his career was concerned. After we finished the interview, I got a tour of his modest abode. I was surprised to see quite a bit of original artwork from many well-known comic strip artists and illustrators, as well as his own work. 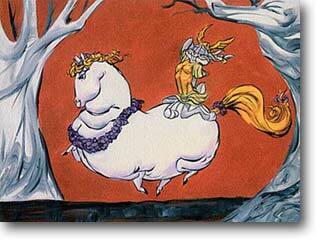 These consisted of mostly oil paintings and pastel studies, more so than animation cels and pencil drawings. Before I left, he asked if I would like some of his sketches, in which he handed me some drawings of a what-if situation: The Road Runner and Coyote having offspring. The warmth and humor that has made me and many others enjoy Chuck's work shone through during my visit with him. Truly a remarkable man, who I must say has and continues to be a source of inspiration in my life as a lifelong animation lover. Jay Sabicer: Let's start off with a brief biography of where you started and what your influences were. 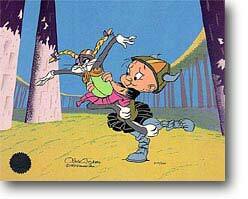 Chuck Jones: It wasn't planned. I suspect that most people don't do what they think they start out to do. I mean, being around, I went to Chouinard Art Institute; I was a high-school dropout, I couldn't stand it cause I did so much more reading than anybody else I knew in high school, and it was very dull. So, my father, when I was supposed to be a junior or something, let me go to Chouinard Art Institute, which is now CalArts. And that's where all the local people went to work for Disney or Warner's or the rest of [the Southern California animation studios] went to school. The basic thing they were looking for when I came out of art school were people that could draw--they didn't want people that cartooned. Because if you're a cartoonist, like a comic strip artist, you have a style, which in fact, indeed you look for something that will identify your work. In animation, that's a handicap, because a good animator can animate Daffy Duck, Bugs Bunny or an elephant or the Grinch, or anything else. In other words, what he needs to do is to draw well. That's still the best, by far the best thing for anybody to have, is actually life drawing. And they really stress that at CalArts among animators: They have to take something like eight hours a week in the three year course they give out there in life drawing, as well as animation and graphic design, and a few other things. JS: So when you entered Chouinard, you had no predilection whatsoever of becoming an animator? CJ: There wasn't really any animation. Most of the animation at that time, which was in the late 1920's -- see I was born in 1912, which makes me seventy-five, and I went to work in 1931 in animation. So two years before that I was at the Chouinard Art Institute named after a lady who founded it, Nelbert Chouinard. Anyway, a great many people out here and all of the art directors out here, architectural designers, and so on went to CalArts or Chouinard, as they called it. So, those of us who came out had a lot of life drawing, where we were pretty well snapped up because at about that time is when all the other studios came out. Disney came out in 1927. I think and some of the other studios started up around 1930. Like Harmen-Ising: they were supplying for Warner brothers. So, when I came out of art school, I didn't know anything about animation, but what I was looking for was a job, being in the middle of the Depression. The idea of [even] getting a job in a service station would've been--anything. [It was] very difficult to get a job in those days. At that time, a man by the unlikely name of Ubbie Iwerks, which spelled backwards is "Skrewi", had broken away from Disney, he was the one that animated all the early Disney films. So, that's how I got in. I wasn't that I looked for it, or that I expected to be an animator, because I didn't even know what an animator was. JS: Was Ub Iwerks one of your main influences? CJ: Well no, it wasn't so much that, it was a place to get a job. But it still holds true; the basic thing that any studio looks for is not a person with a cartoon style. If you're going to do a comic strip you have to have some kind of style, but even there it doesn't matter so much if the idea is good. If you look at the very early Pogos (Walt Kelly) or the very early Schulzes, they didn't even draw very well, but they had a good idea and you might say the style grew out of the need of the contents. JS: An animator is someone who can imitate someone else’s style? CJ: Or originate a style, you see. Bugs Bunny is a combination of personality. He's probably a mixture of Dorothy Parker, D'Artagnan and Rex Harrison, but he is himself. That was the thing: that at Disney and MGM and Warner Brothers, they had a unique form. There's no place else in the world where animated characters, living animated characters, have ever developed. Bugs is not an imitation of another character like the Flintstones [were] imitations of the Honeymooners and Yogi Bear was [Art Carney]. But we tried to find out who a unique character was, so you have Daffy Duck as a personality in himself. You can imitate Daffy Duck and you might say that's the key to any comedian is whether or not he can be imitated. And stand-up comedians don't even try, they get up and might imitate another comedian, but their substance of their humor is the one-liner. But a guy like Jack Benny or Chaplin or Keaton or Woody Allen or any of the modern ones -- Richard Pryor, all these people have personalities of their very own. And they're not imitating anybody else and that's what we tried to do. So, but it takes time when you start with a character like the Coyote or Bugs Bunny it takes time to develop them. That's why doing a series was very helpful, because you might say from the start that Bugs was really just a crazy kind of a nutty rabbit. When Tex Avery brought him out of his fruition in The Wild Hare in 1937, he was a completely different character than what he became later: he's much more suave, much more Rex Harrisonish, if there is such a word. So that is what we tried to do: always bring the characters to life. As I say, very many writers simply ignore the fact that this kind of animation, the unique form of what we call character animation, whether good or bad, is indeed unique to Southern California. Popeye and things done on the East Coast were not personalities, so much as they were moving comic strips. It's like Charlie Brown: on the screen he isn't really a moving comic strip. The individual personalities, which are very well done I think by Bill Melendez, certainly don't bring anything in terms of action. Of course, action is what made our characters live and it's action that made Disney's characters live. Now you can like or dislike the life that was there, but you have to say that's what they were, just like an actor. But the animation director, and all the good animation directors at Disney's, Warner Brothers, and MGM had all been animators. I animated for several years myself, before I became a director. And when you became a director -- you would time the picture to three or four hundred key drawings, showing bodily attitudes and so on and you lay the entire picture out on exposure sheets. And also, you had to be able to time it exactly to length, because we couldn't overshoot the way they do in live-action -- that's too expensive. JS: When you design characters, I know you have a particular style between your pictures and Robert McKimson's and Friz Freleng's pictures; your characters have a different look--the eyes tend to stand out more than anything else. [Chuck laughs] -- It is sort of a devilish look that you give to your characters. What was your influence on that, was it a particular artist -- or did you always draw like that? CJ: No, the one thing I like to do about comedy, I wouldn't have been able to verbalize at the time or justify it, was that I liked to let the audience in, that is, having the characters look at the audience. When the coyote's falling, you know, he will look at the audience. When Bugs gets into those rabbit season/duck season things and then he changes over and says duck season and [then] he says rabbit season and Daffy says duck season, he glances at the audience and (twitches eyebrows) -- that’s only a third of a second usually, maybe eight frames and sometimes ten. But that little quick glance is I think what gives the key for that particular situation and makes it work. We weren't trying to be different, actually we were trying to be the same in a sense that each of the units had some characters that they did exclusively. I did all the Roadrunners/Coyotes up to the time ‘til '63 when some cheap ones were done after that by other people. But I did all the 26 or 28 of them up to that time as a director and I did all the Pepe le Pews. Friz did all the Tweetybird and Sylvester after [Bob] Clampett left in '46, so during the last eighteen or nineteen years he did all of those. And He invented Yosemite Sam. Bob McKimson did the Tasmanian Devil and Foghorn Leghorn, although I did the first one with the little chicken hawk. But we all were doing Bugs Bunny, so we weren't trying to be different, it's just that we were different, that's all. Just like an actor, no matter what he does, he can't help himself, even a great actor like Alec Guinness or Laurence Olivier, who were strong enough to carry almost any kind of a part. But there are still tiny, little mannerisms that will sneak in, and that's the way it is with drawing and a personality. Bob McKimson wasn't quite as creative as, I think, the other directors were. He had been a fine animator if somebody told him what to do. Fortunately, he worked with Tedd Pierce, who was a fine writer, but I think his style is a little more staid perhaps; a little more mechanical. I probably did more experimenting, because it's my nature to do. So, you know like One Froggy Evening and things of this kind and even What's Opera Doc? and so on, I don't think that's the sort of thing that any of the other directors attempted. JS: Did they feel any pressure from the studio itself? CJ: The studio never knew what the hell was going on anyway. Jack Warner didn't even know what we were doing or where our studio was. What you see in those days, I think the thing that saved us was something that can't save anybody else now, is called block booking. That means the cartoons were sold before they were completed. So even if they weren't very good, they were still going to be sent out; that saved our lives because when I made The Dover Boys I'm sure if they tried to sell that, they couldn’t have done so, because it was one of the first [cartoons] of restricted action – intentionally, of the old gay nineties (1890's) kind of action . It startled them, they didn't know what the hell to do with it. But anyway, the audience seemed to like it and it did OK, but the front office...It's about the same situation it is now in networks: the head of the networks won't buy a character unless they've seen it [before]. So today, you can't go in with a new idea. If a comic strip gets very, very well known or a TV show gets very well known and you say I want to animate it, the damn fools say go ahead and animate it. It's terrible! So today, of course we have this dreadful and obscene situation in which we have twenty-five minute commercials, that's gross, that's wrong. Of course, we always have made our films for [movie] theater[s], we never made them for television. JS: You never really made them for children. You made them for a general audience. CJ: We didn't make them for anybody, we made them for ourselves, which was probably the most sensible way to do it anyway. JS: Chuck Jones Enterprises -- what is it doing now? CJ: When I came out of Warner's, none of us had any financial rewards from that - I mean directors, writers, anybody. That closed in '63 so I came out of there as naked as I had gone in almost exactly thirty years before that. But Chuck Jones Enterprises' share in How the Grinch Stole Christmas and the pictures I made, Cricket in Times Square, and those things. So basically, the money that comes to me goes through Chuck Jones Enterprises; my daughter runs that, and she has her own company and that's Linda Jones Enterprises. Oh, six or eight maybe longer years ago, she got the idea about the [animation] cel thing, because Warner's had destroyed all the cels and so on, but there was some work we'd done since--The Bugs Bunny/Road Runner Movie and things of this kind, and there were some of those production cels [in existence]. So, she decided to go into business selling those, and I made up a bunch of pictures from the ones that were destroyed. So that's her business, that's not mine...and if I do a book or anything, that runs through the company; she handles that too -- she wears two hats... it saves me from having to sit here all the time wondering about things and she handles all the nuts and bolts. If there's animation to be done, well we do a little animation through that too. JS: What was the latest project that you’ve worked on? CJ: Well, I did some animation on that Museum of Modern Art opening... and I still have lots of little books I'm writing. JS: Would you recommend to any budding students to get into the industry? CJ: Yes, of course, I was so happy in it and they need good people. I think, that if you're going to be an animator, what you need is a helluva lot of life drawing, because if you come in with that kind of knowledge... You can make animator -- anybody that can draw well, but being able to draw Bugs Bunny doesn't do anybody any good. I also did a stylebook of how to draw the characters from Warner Brothers, who will hopefully be out in next year, but I've made a thousand drawings on how to draw the Warner characters. And I just started with the basic elements and that kind of drawing. Cause every character -- everything you draw has an anatomy, whether you like it or not. The basic point is, if you're gonna do a paramecium, the only thing you have to keep in mind is that the thing can do almost anything in terms of form, but it can't change its own bulk... that's its anatomy. They're amazing critters, and some of them can reach out and develop mouths all over their body which is wonderful. It doesn't matter how much you draw, you can draw characters with any kind, whether it's abstract or weird as anything you want. But if you're going to move them though, they have to live with their own anatomy -- you have to respect that, otherwise it will appear to be rubbery and it wont be believable. And if you want to make a rubbery character, fine; then you have to live with that. It can't be stiff. It's a wonderful, wonderful field. And I think, there's hope that they will be needing a lot of people, because the success of Steven Spielberg’s An American Tail. I'm acting as an advisor now on a picture called Who Framed Roger Rabbit? which Bob Zemeckis and Spielberg are producing and it's being done in England. Richard Williams is animating, and it's about forty-five minutes of animation and they're having cameo parts of Bugs and Daffy, and so on, so I'm kind of representing Warner Brothers on that and I will be going to England on that. JS:You are keeping a fine attitude and you remain hopeful that the industry will realize what's going on. CJ:For many years there, aside from the work I did and of course Disney's, there wasn't any place for a guy to go, but today there is... there were three or four young men that I knew at CalArts when I took their course. Of course, anybody that can spend two years at CalArts is assured of being at work for the rest of their lives, because of the courses they teach -- They also have a very good school at Sheridan College up in Toronto which I think has also wonderful equipment and good teachers. And their people all seem to do extremely well. So, indeed, I believe four or five years from now there will be a lot better and more animation. Jay Sabicer is a graphic designer working with both print and motion graphics. Any correspondence may be sent to jaysabicer@earthlink.net.